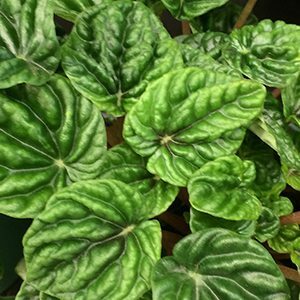 A very easy to grow indoor or house plant, Peperomia come in a range of foliage types. Most are small growing and are excellent for growing in both hanging baskets and pots. These are epiphytic plants, they have fleshy succulent like foliage and are regarded as drought tolerant. The sort of plant you can leave for a week or two and it will still be growing strong when you return. They are also slow growing, so no need to repot or prune much at all. With a number of species they do vary in growth habit. Peperomia clusiifolia have larger leaves and a upright habit. Foliage is green margined with cream. P. japonica has small rounded foliage while P. prostrata, also with small foliage has a natural weeping habit. P. caperata varieties have wonderful textured or ripple foliage. P. argyreia has large ovate leaves, green with creamy white stripes. P. obtusifolia is sometimes called the ‘Baby Rubber Plant’. 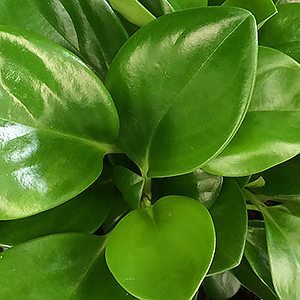 In warmer sub tropical areas, Peperomia can be grown as an understory plant, however they are are most commonly grown as indoor plants. Best grown in good filtered light, they do need to have a period between waterings where the growing mediums drys partially. Good drainage is essential. They are a not a plant that require a lot of fertiliser, a week 30% liquid fertiliser once a month is usually sufficient. They are a plant that likes to have a contained root system, so do not over pot.